Ban Ki-moon (Hangul: 반기문; hanja: 潘基文; born 13 June 1944) is a South Korean statesman and politician who is the eighth and current Secretary-General of the United Nations. 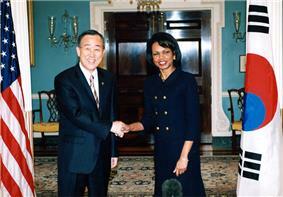 Before becoming Secretary-General, Ban was a career diplomat in South Korea's Ministry of Foreign Affairs and in the United Nations. He entered diplomatic service the year he graduated from university, accepting his first post in New Delhi, India. Ban was the foreign minister of South Korea from January 2004 to November 2006. In February 2006 he began to campaign for the office of Secretary-General. Ban was initially considered a long shot for the office. As foreign minister of South Korea, however, he was able to travel to all the countries on the United Nations Security Council, a maneuver that turned him into the campaign's front runner. On 13 October 2006, he was elected to be the eighth Secretary-General by the Darfur conflict, where he helped persuade Sudanese president Omar al-Bashir to allow peacekeeping troops to enter Sudan. Ban was named the world's 32nd most powerful person by the Forbes list of The World's Most Powerful People in 2013, the highest among South Koreans. In 2014, he was named the third most powerful Korean after Lee Kun-Hee and Lee Jae-yong. Ban was born on 13 June 1944 in the small farming village of Haengchi, Wonnam Township (-myeon), in Eumseong County, North Chungcheong Province in Korea. His family then moved to the nearby town of Chungju, where he grew up. During Ban's childhood, his father had a warehouse business, but the warehouse went bankrupt and the family lost its middle-class standard of living. When Ban was six, his family fled to a remote mountainside for much of the Korean War. After the war ended, his family returned to Chungju. Ban has mentioned meeting American soldiers at this time. He received a bachelor's degree in international relations from Seoul National University in 1970, and earned a Master of Public Administration from the John F. Kennedy School of Government at Harvard University in 1985. At Harvard, he studied under Joseph Nye, who remarked that Ban had "a rare combination of analytic clarity, humility and perseverance". Ban was awarded the degree of Doctor of Laws (Honoris Causa) by the University of Malta on 22 April 2009. He further received an honorary degree of Doctor of Laws from the University of Washington in October 2009. In addition to his native Korean, Ban speaks English and French. There have been questions, however, regarding the extent of his knowledge of French, one of the two working languages of the United Nations Secretariat. ^ a b Eumseong County: "The Birthplace of the UN Secretary-General Ban Ki-moon"
^ a b c "Official U.N. biography". United Nations. Archived from the original on 11 September 2007. Retrieved 2007-08-12. ^ Lynch, Colum (17 April 2007). "Sudan To Allow U.N. Force In Darfur". ^ a b c Martin Fackler (22 December 2006). "On His Ancestors' Wings, a Korean Soars to the U.N.". ^ a b c d e f g Maggie Farley and Bruce Wallace (9 October 2006). "Aspiring U.N. Chief Is a Harmonizer, Not a Rock Star; South Korean career diplomat Ban Ki-moon may lack charisma, but he has many fans". ^ a b c d e Anna Fifield (10 October 2006). "Relentless pursuit brings a challenge close to home; Profile Ban Ki-moon". ^ a b "Is Ban Ki-moon a franco-phoney?". ^ a b c "Profile: Ban Ki-moon". ^ a b c d e Lee Joo-hee (15 February 2006). "Ban surges toward next career step". ^ a b "Can This Guy Run the U.N.?". ^ Colum Lynch (29 September 2006). "S. Korean Contender for U.N. Post Has an Edge; Ban Ki Moon's Rivals Complain About His Role in Foreign Aid and Trade Policy". ^ Park Song-wu (14 February 2006). "Minister Ban to Run for Top UN Job". ^ "Ban takes 1st Straw Poll". UNSG.org. 24 July 2006. Archived from the original on 8 August 2007. Retrieved 28 September 2006. ^ "Ban firms up lead in second Straw Poll". UNSG.org. 14 September 2006. Archived from the original on 12 June 2009. Retrieved 28 September 2006. ^ "Ban slips but holds, Vīķe-Freiberga pushes into third". UNSG.org. 28 September 2006. Archived from the original on 12 June 2009. Retrieved 28 September 2006. ^ "Ban Ki-moon wins". UNSG.org. 2 October 2006. Archived from the original on 4 November 2006. Retrieved 2 October 2006. ^ "The Quest for Peace and Prosperity in the Asia-Pacific and Beyond". Ban Ki-moon address to Asia Society (transcript). 25 September 2006. Retrieved 2 August 2007. ^ Gamage, Daya (30 April 2010), "UN’s Lynn Pascoe cannot avoid being influenced by US State Department agenda on Sri Lanka", Asian Tribune. Retrieved 7 June 2011. ^ a b "Enter Mr Ban; The UN's new secretary-general" (PDF). ^ Beeston, Richard; Bone, James (26 September 2006). "Millions of dollars and a piano may put Korean in UN's top job". ^ Lynch, Colum (28 September 2006). "S. Korean Contender for U.N. Post Has an Edge". The Washington Post. Retrieved 2007-08-02. ^ "United Nations Webcast of announcement". United Nations. Archived from the original on 7 August 2007. Retrieved 2007-08-02. ^ a b c "Mission impossible?—The United Nations". ^ "Secretary-General's encounter with the UN press corps (transcript)". ^ a b c Mark Turner (1 February 2007). "Ban's month of muddle: how the new UN chief is struggling to win over the doubters". ^ "Statement attributable to the Spokesperson for the Secretary-General on the death sentences in Iraq". United Nations. 6 January 2007. Retrieved 2 August 2007. ^ "U.N. chief calls for justice in Cambodia". ^ "Arrhenius End of Assignment Report" (PDF). ^ Julia Preston (6 January 2007). "Tanzanian Woman Is Chosen for U.N.'s 2nd Highest Post". ^ Stevenson Swanson (11 April 2007). "Leaders making world of difference\ Higher profile at UN brings new emphasis on issues affecting women". ^ a b c d Maggie Farley (11 April 2007). 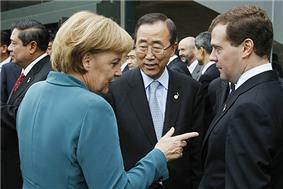 "Ban Ki-moon learns the hard way". ^ "MOFA spokesman slams Ban Ki-moon for rejecting UN bid". ^ Colum Lynch (2 March 2007). 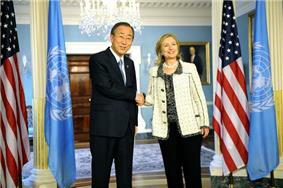 "U.N. Secretary General Calls Global Warming a Priority". ^ Foderaro, Lisa. "Taking a Call for Climate Change to the Streets". www.nytimes.com. The New York Times. Retrieved June 15, 2015. ^ "British, French embassy workers on trial over Iran protests". CNN. 9 August 2009. Retrieved 2010-04-07. ^ "Iran admits 4,000 June detentions". BBC News. 11 August 2009. Retrieved 2010-04-07. ^ Ganji, Akbar (12 August 2009). "Dear Mr Ban, heed the Iranian people". The Guardian (London). Retrieved 7 April 2010. ^ Cheryl Corley (2 August 2007). "United Nations Deploys Peacekeeping Troops to Darfur". 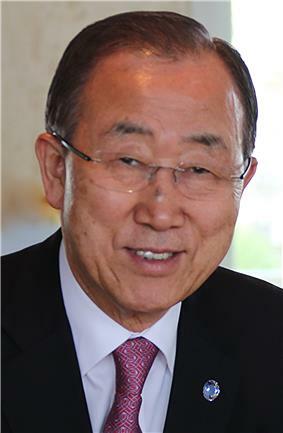 ^ "General Assembly Appoints Secretary-General Ban Ki–moon to Second Term of Office". UN Press Office. 21 June 2011. Retrieved 22 June 2011. ^ Ki Moon, Ban. "Message to Human Rights Council meeting on Violence and Discrimination based on Sexual Orientation or Gender Identity". United Nations. ^ Summers, Claude J. (3 March 2012). """AllOut.org Video: Ban Ki-moon: "The Time Has Come. glbtq. Retrieved 25 May 2015. ^ Ban Ki-moon (11 December 2012). """Secretary-General's remarks to special event on "Leadership in the Fight against Homophobia. United Nations. Retrieved 25 May 2015. ^ 반기문 총장 아들 내달 결혼. ^ "Transcript of Press Conference by Secretary-General-Designate Ban Ki-moon At United Nations Headquarters". ^ "'"Disquiet grows over performance of Ban Ki-moon, UN's 'invisible man. The Guardian. July 22, 2010. ^ "'"The U.N.'s 'Invisible Man. The Wall Street Journal. July 14, 2009. ^ "Nowhere Man". Foreign Policy. June 21, 2009. ^ "Reply to a parliamentary question about the Decoration of Honour" (pdf) (in German). p. 1446. Retrieved November 2012. ^ "Samsung Chairman Lee Receives Van Fleet Award". KBS World. 20 September 2006. Archived from the original on 2014-02-03. Retrieved 2006-09-28. ^ Ralph Riegel (21 August 2013). "Mandela, Clinton and Geldof among the former winners". ^ "Ban Ki-moon praises 'truly historic' referendum result". ^ "Mongolia a ‘role model’ for other developing countries, Ban says". UN News center. 28 July 2009. Retrieved 3 July 2012. ^ "Press Release: Mr. Ban Ki-moon, Secretary General to UN conferred with ‘Doctor of Letters’ at Jamia". Retrieved 4 February 2014. ^ "‘Make the choice of service,’ UN chief tells Georgetown graduates". 16 May 2015. Retrieved 17 May 2015. ^ a b Colum Lynch (21 October 2007). 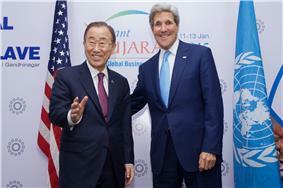 "Under U.N. Chief, Koreans in Key Posts: Ban Ki-moon Denies Playing Favorites". ^ "Investigator says Ban is 'embarrassing' himself", New York Post, 20 July 2010. Retrieved 7 June 2011. ^ Inga-Britt Ahlenius, End of Assignment Report, 14 July 2010, p. 22. Retrieved 30 July 2012. ^ End of Assignment Report, pp. 32, 48 Inga-Britt Ahlenius, 14 July 2010. Retrieved 30 July 2012. ^ "Ban Ki Moon Joins The North Korea-Security Council Debate". UN Dispatch. Archived from the original on 28 May 2010. 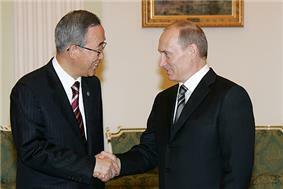 Retrieved 25 May 2010.
International human rights organizations are critical of Ban Ki-moon for lacking accountability over negligent actions by the United Nations. Scientists and journalists conclusively proved that UN peacekeepers from Nepal were the source of the 2010–13 Haiti cholera outbreak, which has killed approximately 9,000 people and infected more than 1 in 20 Haitians. Ban has declared that the legal immunity of the United Nations before national courts should be upheld, though this does not reduce the UN's moral responsibility to overcoming Haiti's cholera epidemic. Ban is named in a lawsuit challenging UN immunity on behalf of Haitian cholera victims in the U.S. District Court of Manhattan. In January 2015, Judge J. Paul Oetken dismissed the case, affirming UN immunity. An appeal to Oetken's decision was submitted to the Court in May 2015. In 2013, Ban Ki Moon was accused of undermining collective bargaining rights of The Staff Coordinating Council, the union representing United Nations staff. Ban unilaterally eliminated the role of the union to negotiate on behalf of the employees and terminated talks when the union protested. The United Nations champions the right to collective bargaining as a basic human right in its own charter, enacted as the Right to Organise and Collective Bargaining Convention, 1949; Article 1. Former UN corruption fighter James Wasserstrom has also been critical of Ban Ki-moon for attempting to limit the jurisdiction of the UN dispute tribunal following his dismissal from his Kosovo and lengthy appeals process. Ban had refused to hand over confidential documents relating to the case to the UN personnel tribunal, despite repeated orders by the court to do so. In relation to another case, Ban was admonished by Judge Michael Adams for "wilful disobedience" for again failing to hand over key documents in an internal promotions dispute. During the ROKS Cheonan sinking events, he took the step of demanding action against North Korea for the alleged sinking of a vessel from his country. This was reported by U.N. Dispatch as being unusual, because it is rare for any Secretary-General—and particularly Ban Ki-moon—to comment on the Security Council taking action on an issue as his office had tended to be extremely deferential to the Security Council. Ban Ki-moon, in his capacity as Secretary-General of the United Nations, was one of the Olympic Flag carriers of the 2012 Summer Olympics opening ceremony. During his tenure at the South Korean Foreign Ministry, Ban's nickname was jusa, meaning "the Bureaucrat" or "the administrative clerk". The name was used as both positive and negative: complimenting Ban's attention to detail and administrative skill while deriding what was seen as a lack of charisma and subservience to his superiors. The South Korean press corps calls him "the slippery eel", for his ability to dodge questions. His peers praise his understated "Confucian approach", and he is regarded by many as a "stand-up guy" and is known for his "easy smile". After he assumed a post of United Nations secretary general, he is caricatured as "invisible man", "powerless observer", or “nowhere man” for his lack of powerful personality and leadership. They have three adult children: two daughters and a son. His elder daughter, Seon-yong, was born in 1972 and now works for the  His mother is a Buddhist. Throughout 2012, Ban expressed his concern about the continuing Israeli–Palestinian conflict, in particular the condition of the Palestinian hunger strikers in Israeli prisons and the movement restrictions imposed on Gaza Strip residents. On 30 August 2012 Ban criticized the Iranian leadership due to their statements regarding Israel's destruction and denying the Holocaust. On 16 August 2013, Ban Ki-moon admitted that the UN was biased against Israel, stating in a meeting with Israeli students that there was a biased attitude towards the Israeli people and Israeli government at the UN. He described this as "an unfortunate situation." A few days later, he backtracked on the utterance. The aftermath of the Libyan Civil War and other events of the Arab Spring continued to commanded Ban's attention with the start of his second term. He focused in 2012 on what he termed "intolerance" in the Arab world. After traveling to Vienna to participate in the opening of the KAICIID Dialogue Centre to foster interreligious dialogue, Ban commented, "Many countries in the Arab world including Saudi Arabia are changing. Since the Arab Spring, the leaders have begun to listen to the voice of their people." He was however criticised in the Austrian press for associating himself with a project of Saudi King Abdullah, Saudi Arabia being a location of perceived religious intolerance. Ban appointed Swedish diplomat Jan Eliasson as his new Deputy Secretary-General on 2 March 2012. He also named Susana Malcorra of Argentina his chief of staff. The appointments were part of Ban's commitment to replace top positions in his group for his second term. On 17 June 2011, he received the recommendation of the Security Council by a unanimous vote, and, on 21 June, his nomination was confirmed by a unanimous acclamation vote at the United Nations General Assembly. His new five-year term as Secretary-General commenced on 1 January 2012 and will end on 31 December 2016. The Libyan Civil War began in 2011, the last year of Ban's first term, and dominated his attention and public statements that year. Throughout the conflict, he lobbied for peaceful solutions to the crisis. He frequently spoke out against military action in Libya, believing that a diplomatic solution would be possible and preferable. However, he conceded that if then leader Muammar Gaddafi refused to abide by a cease fire agreement, the international coalition of military forces would have no choice but to intervene to protect the human rights of Libyans. The Gaddafi government was eventually overthrown and Gaddafi killed in the conflict. Although the 2009 Iranian presidential election was widely disputed, Ban Ki-moon sent a traditional congratulation message to the Iranian president upon his inauguration. He kept silent over the request of Shirin Ebadi to visit Iran after the crackdown on peaceful post-election protests by the Iranian police, which was perceived as a crime against humanity. More than 4,000 people were arrested and nearly 70 were killed, some while being held in prison. In another incident, several prominent intellectuals including Akbar Ganji, Hamid Dabashi, Noam Chomsky went on a three-day hunger strike in front of the UN. The incident was followed by an official request by more than 200 intellectuals, human rights activists and reformist politicians in Iran for the UN reaction. Ban Ki-moon however did not take any action to stop the violence in Iran. Ban early on identified greenhouse gas emissions. On 1 March 2007 in a speech before the UN General Assembly, Ban emphasized his concerns about global warming. Ban stated, "For my generation, coming of age at the height of the Cold War, fear of nuclear winter seemed the leading existential threat on the horizon. But the danger posed by war to all humanity—and to our planet—is at least matched by climate change" (referring to Global Warming, see P:GW portal). On 3 September 2009 he further emphasized his concerns at the World Climate Conference in Geneva, when he stated, "Our foot is stuck on the accelerator and we are heading towards an abyss". In September, 2014, Ban joined demonstrators in the People's Climate March in New York City, and also called together world leaders for the UN Climate Summit, in preparation for the United Nations Climate Change Conference to be held in Paris in late 2015. 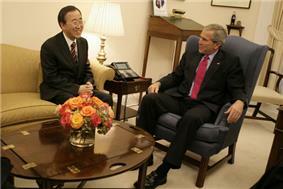 U.S. President United Nations Secretary-General Ban Ki-moon of South Korea in October 2006. In their early meetings, Ban stressed the importance of confronting global warming. On several prominent issues, such as proliferation in Iran and North Korea, Ban has deferred to the Security Council. In 2007, the Republic of Nauru raised the issue of allowing the Republic of China (Taiwan) to sign the Convention on the Elimination of All Forms of Discrimination Against Women. Ban referenced the United Nations General Assembly Resolution 2758, and refused the motion. On 19 July 2007, Taiwanese President Chen Shui-bian wrote to request admission into the UN by the name Taiwan. Ban rejected the request, inaccurately stating that Resolution 2758 defined Taiwan as part of China. During the period in which these polls took place, Ban made major speeches to the Bush administration as he pursued the position. But Ban also opposed several U.S. positions: he expressed his support for the International Criminal Court and favoured an entirely non-confrontational approach to dealing with North Korea. Ban said during his campaign that he would like to visit North Korea in person to meet with Kim Jong-il directly. Ban was viewed as a stark contrast from Kofi Annan, who was considered charismatic, but perceived as a weak manager because of problems surrounding the UN's oil-for-food program in Iraq. Ban was appointed Anti-Ballistic Missile Treaty in 2001, not long after the United States had decided to abandon the treaty. To avoid anger from the United States, Ban was fired by President Kim Dae-jung, who also issued a public apology for Ban's statement.